Welcome back, my tenderfoot hackers! Well, the first season of Mr. Robot just ended and Elliot and fsociety successfully took down Evil Corp! They have effectively destroyed over 70% of the world's consumer and student debt! Free at last! Free at last! Of course, global financial markets crashed as well, but that's another story. Although there were many elements that made the hack successful, such as Darlene developing a zero-day exploit (I'll showing you how to do that in a future article) that none of the intrusion detection systems, firewalls, or antivirus softwares detected, Elliot also made certain that the hack could not be traced back to him by using proxies. Early in the last episode, Lenny, the former boyfriend of Elliot's therapist, Krista, reveals to Krista that he had been hacked by Elliot. He points out that Elliot is nearly untraceable as he uses a proxy from Estonia. 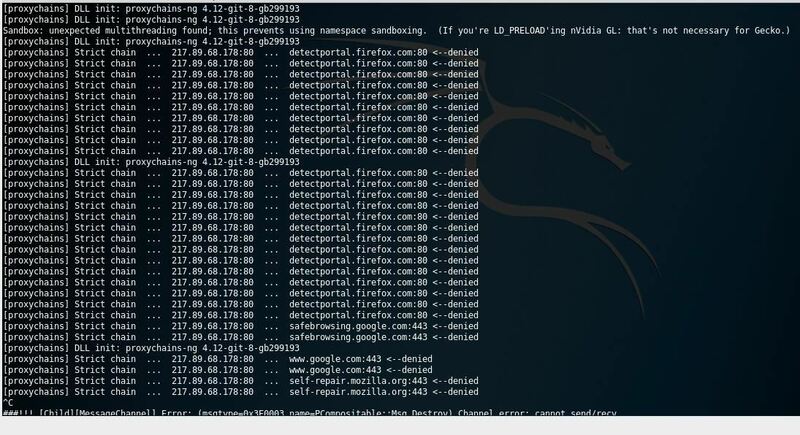 In this tutorial, I will show how Elliot bounced his attack off an Estonian (or other) proxy in order to make his hacks untraceable. As you know, whenever you visit (or hack) a website or server over the Internet, your unique Interpret Protocol (IP) address travels with you. It would then be very easy to trace the source of an attack by simply tracing the source IP address. Hackers, though, often use proxies to hide or obscure their IP address. 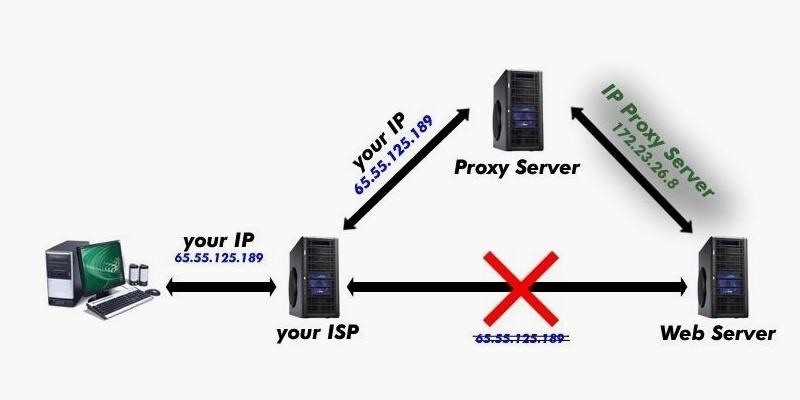 In this way, they send their traffic to an intermediary proxy, who then sends the traffic on to the destination, replacing the source IP address with its own. In this way, the malicious traffic appears to be coming from the proxy and not the original sender. Before I start, I want to point out that there are multiple types of proxies. One of the more popular, anonymous proxies is Tor. Although Tor is effective in anonymizing your traffic from Google and other commercial tracking, it is not effective in anonymizing your traffic from law enforcement, especially the NSA. 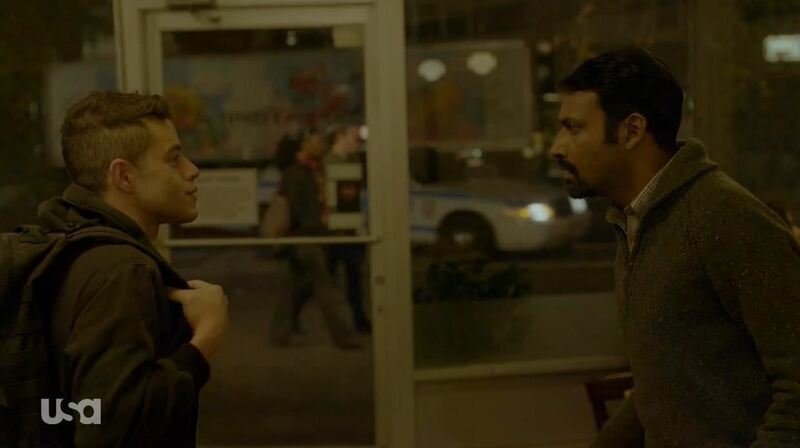 As Elliot points out in the pilot episode, when he is explaining to the coffee shop owner who is also a child pornographer, "Whoever's in control of the exit nodes is also in control of the traffic, which makes me the one in control." He owns the exit node, owns the traffic, and hence, the identity of the users. Now, let's see how Elliot and fsociety hid their identity in their hacks! To get started, fire up Kali Linux. If don't already have Kali, you can download it here. Let's try using SamAir Security. 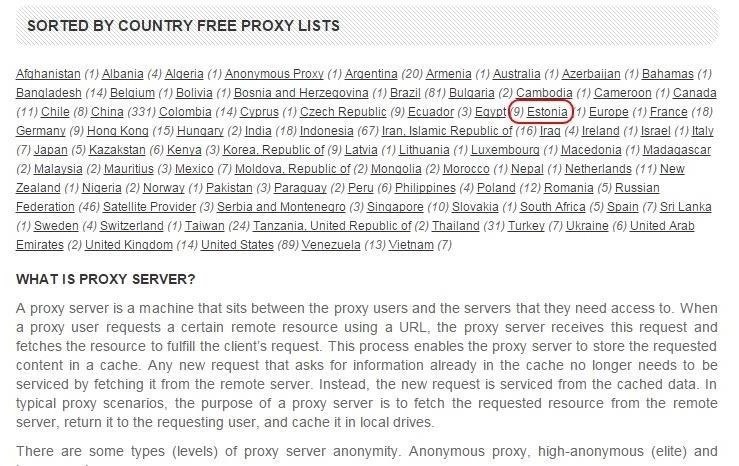 When we navigate there, we can see their list of free proxies. Near the bottom of the page, we can see that they have sorted the proxies by country. Remember, Elliot was using a proxy in Estonia. 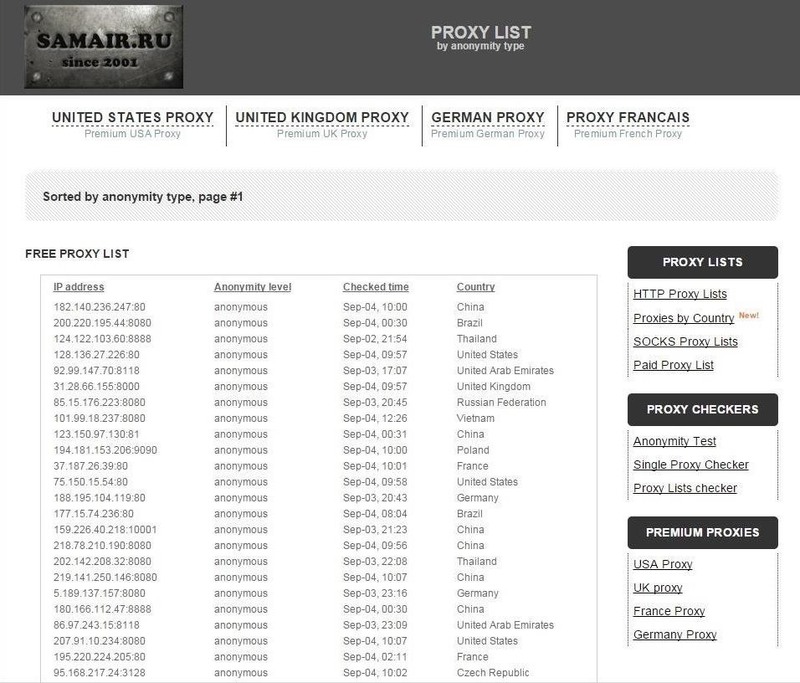 This list has one proxy listed in Estonia. When click on it, we can see that this one proxy in Estonia is a transparent proxy. This means it won't hide our IP. That won't work! Instead, let's try the list of Russian proxies. Many hackers use Russian proxies as EU and U.S. law enforcement do not have jurisdiction in Russia. This means there is little or no chance of tracing their identity. 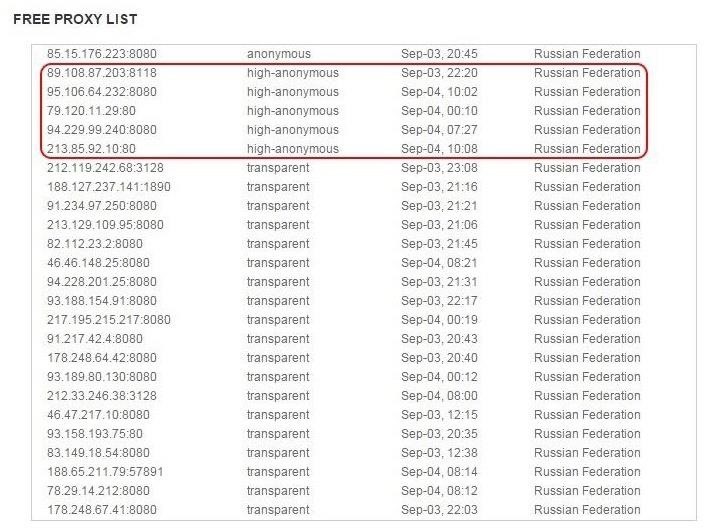 We can see that there are five "high-anonymous" proxies in Russia on this list. Let's us one of those. We can open it with any text editor, but I will use Leafpad here. This opens the configuration file for proxychains as seen below. Near the bottom of the file is the critical part. Here is where we tell proxychains which proxy to use. By default, proxychains is setup to use Tor. 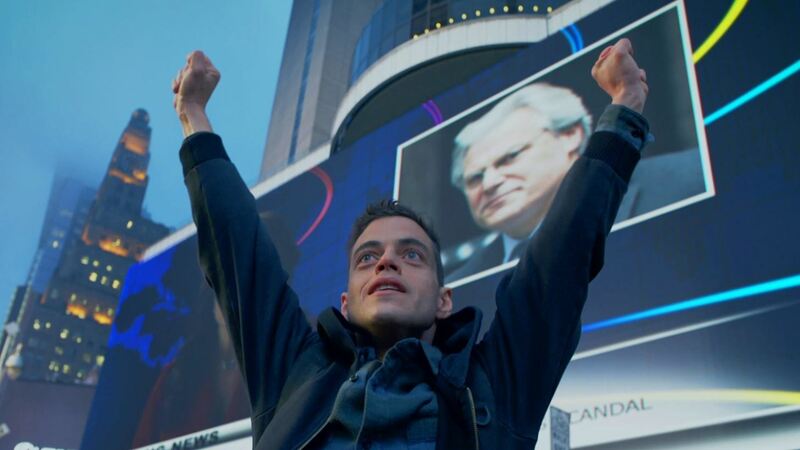 As Elliot expressed in episode one, he who controls the exit node of Tor controls the traffic. Elliot is certainly aware that the NSA and law enforcement know this as well and would not want to use Tor. To disable Tor, simply put a comment mark (#) before line #64. Now, to use one of our Russian proxies, we simply need to add the type of proxy (http) and the IP address and port for that proxy as I have done above. Then, save the proxychain.conf file and close it. Now, all of our traffic will go through the proxy and will appear to be coming from that proxy should anyone inspect the traffic. If you want to learn more about hacking, please take the time to explore Null Byte. If you are interested in becoming a professional hacker, check out my article "How to Use Null Byte to Study to Become a Professional Hacker." Finally, keep coming back my tenderfoot hackers, as I continue to demonstrate each of Elliot's and fsociety's hacks! Great article, thanks OTW. Fired up iceweasel with proxychains (I'm using proxychains4 btw) and accessed whatismyip.com, it showed my real IP... I'm pretty sure the proxies are working (using 3). Could they be using some different method to retrieve it? finally i knew how these proxies work.Thanks. i would personally recommend using VPN its not still safe but much safer than getting MIMT or MIBT so pls dont use proxy you dont know about. Can we say a hacked wifi from too far with a strong yagi antenna + no log vpn(bought via mixed bitcoins) + proxychains(highly anonymous offshore proxy) over TOR is nearly impossible to trace? Nearly impossible, but not impossible. In addition, your connection will likely be slow and unstable. Which proxy type we need to use to be more secure? What's difference between http and socks proxy? Could you explain why Elliot used proxies? I thought VPNs were meant to be much more secure? But i have a quistion, I thought all along that tor worked like this: ? Like a "key system" I dont remember what its excatly called, but i think you understand. What is the diffrent? Because im pretty sure this isnt a proxy, unless the place who gets the diffrent keys always are changing?! Correct me if im wrong, I just need to make sure about this is how tor works? They are similar, but ToR has been compromised. So I can jsut type proxychains msfconsole to run all metasploit framework operations through proxies? Also can I do any data over HTTP proxies? Hey guys, i was trying to use proxy with https://null-byte.wonderhowto.com/how-to/hacks-mr-robot-elliot-fsociety-made-their-hack-evil-corp-untraceable-0164294/ this guide. I have edited my .config file.I checked proxy with SamAir's proxy checker and it says its elite :D.But when i type proxychains iceweasel to terminal. An iceweasel browser opens but i cannot surf. It says "Server not found" how can i do? 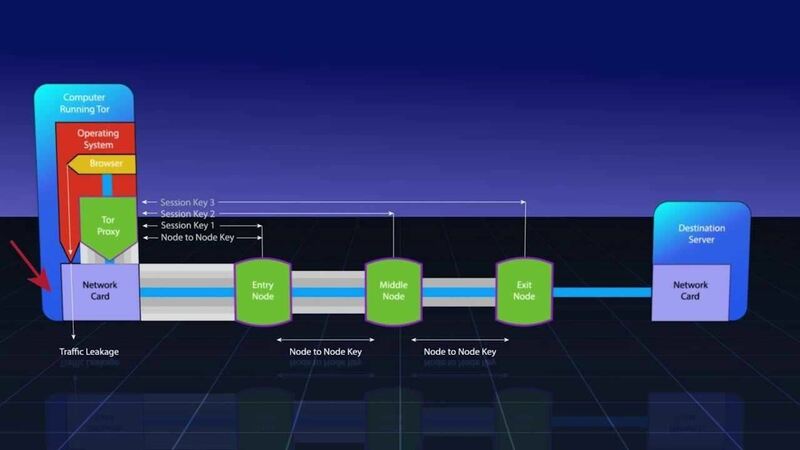 First, I assume you can connect without proxychains? Second, if you can, can you send us a screenshot of your config file? Third, make certain that you use tabs between the type of proxy and the IP address. We are not here to check your typing.I'm going to let you find it. i have same problem too, and i cant find any solutions. did you find the solution? Ignore the GLib-CRITICAL message. It has nothing to do with the connection problem and it looks like it's out since ages. See my post below for a hint on getting it running. Thanks for the info pal. in your config file you may want to try removing the colon and using tab instead to seperate the proxy address from the port you are using, in the same way it is done in the 64th line. If it's working then (like with me - no more timeouts), you might try to install it again to get a clean config file in /etc/privoxy/config. Additionally check that you're using tabs as delimiter: 2 between "http" and the IP and 1 between IP and PORT - that's how it's working for me. Making sure that I have tabbed two times in my .conf file. 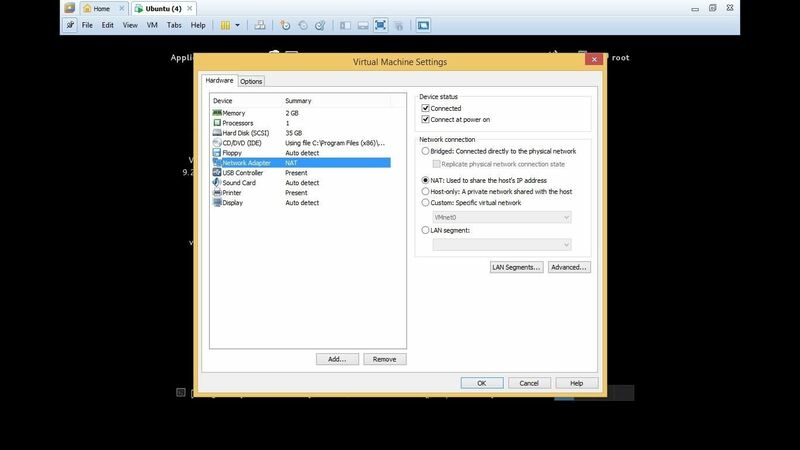 Setting Iceweasel's proxy settings to "use system proxy settings"
It is said further up that this has no effect, but I just wanted to put it in. Hello, master. Thanks for article but i have a problem. I configure my config file then i type proxychains iceweasel. When i type it an iceweasel browser opens but everything is normal, how can i fix this? NOTE: yes, i use 2 tabs and i havent got provioxy. What do mean by "everything is normal"? My IP Adress is same, and nothing appears in terminal. 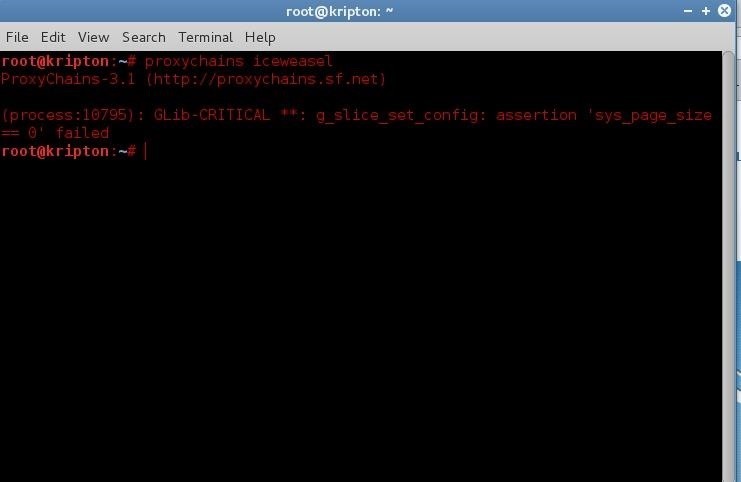 How are you checking your IP and what do you mean "nothing appears in the terminal"? I use whatismyip.org for check my IP. 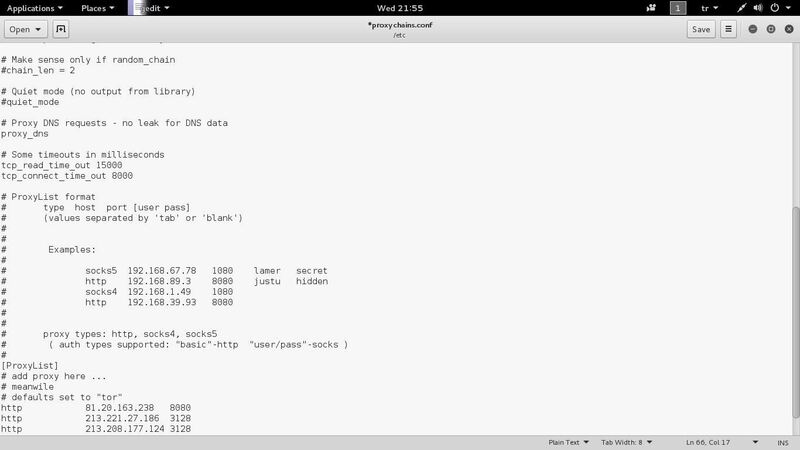 and this is my terminal. NOTE: sorry for bad English,i am trying to learn. That is a critical piece of info you left out! Proxychains never ran it gave you a error. Go back and check you config file for typos and use only one tab. It looks like you failed to a colon between the IP and port. I am doing everything right. And i think my proxies are working -i checked in samair.ru-, how can i fix this? I searched for its solution but i can not find. And KEN STAR says; "Ignore the GLib-CRITICAL message. It has nothing to do with the connection problem and it looks like it's out since ages." so i just ignored it. Also i tried one tab too, but its same :/ is there a typo? i didn't saw it, if there is please help me. You are obviously NOT doing everything right. Did you fix the colon issue I pointed out earlier? after doing this you will have to use the proxychains4 command instead of only typing proxychains, other then that all you need is to edit your config file again (which is in the same directory) in order to add your proxys of choice. also an easy way to test if your proxy is working is with the command "curl icanhazip.com"
this didnt work, and that video is no longer available. Now i'm in worse shape then i was before trying proxychains4. Awesome i will be trying this, as i have yet to get proxychains to work! does anyone know a good trustworthy place to find FREE proxies? Ive been trying some from SamAir Security but the ones ive been trying all time out. For anybody who is still having trouble making the proxy work no matter how you change the text /etc/proxychains.conf I found a solution that worked for me and i am pretty sure it may work for you. I am pretty sure that i installed proxychains 4 to the wrong place, so even though the command "leafpad /etc/proxychains.conf " does open up the .conf file that has the right version, no matter how many changes i made, nothing seemed to work. Solution: open file folder and just search for "proxychains" or just "proxychains.conf", there you will see the proxychains.conf if you click to open the file and see at the bottom where you have made change using "leafpad /etc/proxychains.conf" that no changes have been made, that means that you have been updating the wrong file. Simply add your proxy, then save and enter "proxychains4 iceweasel" and it should be working. if you don't know how to install proxychains 4, just check the above comments, somebody posted it already. I just realized that my earlier post was wrong, i will keep the above post in case it miraculously helped someone. I have a noob`s question here... So, Ok, my proxychain4 is working fine, but while testing it, I found something that`s bothering me. I entered in one site that showed me the proxychain IP, but it showed me my real LAN address, so it couldn`t be used to track me back? And if so, how I could hide it too? I configured the proxychains file as the tutorial asked me too. However when I typed proxychains.iceweasel iget this message => exec: iceweasel: not found. How can this be solved? PLease someone help me. Do you have icewasel installed? I just keep getting denied on multiple proxies lol. Thoughts anyone?